Hello readers! Like many players, I’m excited by the release of Team Up. A new set means lots of new decks and strategies to discover, and that’s always fun. Jirachi and Erika's Hospitality are useful cards that will boost consistency, something that is needed in Standard at the moment. Zapdos is a powerful attacker, but not overwhelmingly so, and should make for a good inclusion in non-GX decks. Viridian Forest has a good design and I like that one of the most iconic places of the Pokemon world is finally getting featured on a card. Black Market Prism Star and Wondrous Labyrinth Prism Star both have powerful but specialized effects, Alolan Exeggutor has potential in Expanded thanks to Exeggcute and Double Dragon Energy, and Pokémon Communication is finally back, which is great because it’s a consistency card that actually favors Evolution decks. Everything seems good, then — except for one catch: I hate Tag Team Pokemon. Almost nothing about them is new, and they don’t even recycle good concepts. Basic Pokemon with huge HP and expensive but destructive attacks? We’ve seen them already: they were called Pokemon-EX, and they heralded the least strategy-based era in this TCG. Top-tier decks were all based around one or two Pokemon-EX and a support Pokemon, and then only around Pokemon-EX as Trainers grew powerful enough to eliminate the need for support Pokemon. Evolutions couldn’t keep up and we played 30 Items in every deck until our savior Garbodor stepped in. Tag Team Pokemon are just Pokemon-EX, but with their traits even more exaggerated, and that doesn’t inspire a lot of confidence in me. The one thing I like about Tag Team Pokemon is that their GX attacks have two “modes,” depending on how many Energy are attached to the Pokemon. This does add a level of strategizing: do you use your GX attack now even though you won’t get the bonus effect, or risk waiting to possibly get more mileage out of it? That said, there’s no reason for these attacks to only be printed on Basic Pokemon that award three Prizes, so they don’t justify the existence of Tag Team Pokemon. The point of that rant wasn’t to say that I will never play Tag Team Pokemon. I’m a competitive player first and foremost, so if they’re the best option, I’ll play them. I simply believe that thinking about the overall design of the game, and not simply the short-sighted consideration of what is the best deck in the current meta, can be a valuable exercise. I have to admit, though, that I’ll be more inclined to search for ways to beat Tag Team Pokemon than to actually use them. Which is why, recently, I’ve been looking at Passimian — a deck that’s been underrated considering its tournament results, and one that I think is even more promising in the upcoming Standard format. In this article, I’ll explain why this deck, originally thought of as a joke, is actually good; why it’s getting better with Team Up; and what a list could look like, both before and after the release of the new set. Passimian has actually seen quite a bit of success in the Standard format since Lost Thunder was released. If you’re surprised, it might be because you didn’t consider results from outside of North America: Passimian saw quite a lot of success in Latin America and Europe. On the first tournament of that specific format, the International Championship in Sao Paulo, the Brazilian duo of Gustavo Wada and Lucas Henrique de Araujo Pereira both reached Top 32 with the deck. French prodigy Maxence Feuillard also used the Brazilian list to reach Top 4 in the Junior division. I talked to Lucas at the event and he told me that although he and Gustavo didn’t originally have a lot of confidence in Passimian, once they built it they kept beating all the other meta decks, so they felt they had no choice but to play it. Fast forward to December and Harrogate Regionals in the UK. Ondrej Skubal, a semi-retired Czech player who was playing his pet deck — Passimian — reached Top 8. His countryman Phong Nguyen got Top 16 with the same list. This inspired some accomplished European players such as Benjamin Pham to pick up the deck for League Cups. Finally, in January, Patricia Gonzalez Walsh won the Special Event in Argentina with Passimian, while another Argentinian player, Tomas Blei, got Top 4. Clearly, Passimian is a deck that is able to win major events. Top players increasingly trust it and are comfortable playing it against such popular decks as Blacephalon-GX / Naganadel, Zoroark-GX variants, or other non-GX decks. I think it’s time to admit that it’s a “real deck” and not a meme. Passimian lists can differ by quite a few cards, whether it’s the choice of tech attackers, the Supporter lineup, or the inclusion of Items such as Counter Catcher. However, their general structure stays the same. Current Passimian lists, in addition to running four Passimian, also play Tapu Koko, usually four, and a Tapu Lele with the Magical Swap attack (either the Fairy or Psychic type, or both). 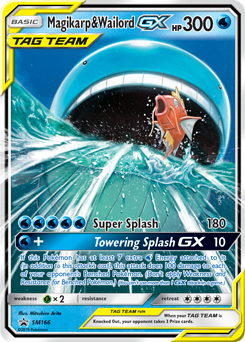 This means that the deck can deal damage both “vertically” and “horizontally.” By “vertically,” I mean attacking the Active Pokemon with Team Play; by “horizontally,” I mean spreading damage across the board with Flying Flip. Spread decks can be powerful, but they all have innate weaknesses: if an opponent can heal damage from all their Pokemon, or limit their Bench, or set up a powerful high-HP attacker quickly, then the strategy of spreading damage won’t pay off. By adding Passimian, and therefore the ability to deal solid direct damage, these decks can threaten opponents in a different way. It is this flexibility that makes Passimian interesting. Depending on what your opponent is playing, you might play the game in a completely different manner. Are they using a Zoroark-GX deck? You can beat them by one-shotting every Zoroark-GX they play down. Are you playing the mirror match? Just spread damage around and avoid taking Prizes until the end of the game, so you don’t allow your opponent to use Counter Energy (and therefore Magical Swap). It’s also worth mentioning that spread decks typically do great against Ultra Beast decks since they can take three or more Prizes in one turn with Magical Swap and therefore never allow the opponent to play a Beast Ring.